Fall is officially here!!! Yahoo!! I love it… the “not too warm” days and the cool nights. I always want to kick back and stamp this time of year. Ok, so I always want to kick back and stamp… any time of year, but I specially love to stamp and scrapbook it in the fall. I thought I’d kick off the new season with a new website design. I hope you like the new colors and layout. Leave a comment to let me know what you think. I’ve been preparing projects for my Halloween/Fall stamp camp next week so I’ve been designing various Halloween treat containers. I love this one. It is a little metal tin from The Angel Company. I filled it with candy corn and wrapped it with ribbon. I used a pumpkin sticker from my local discount store to make the tag and a current GWP (Gift With Purchase) stamp from The Angel Company to make the “Halloween” tag. It was super easy. It took all of 10 minutes to make. 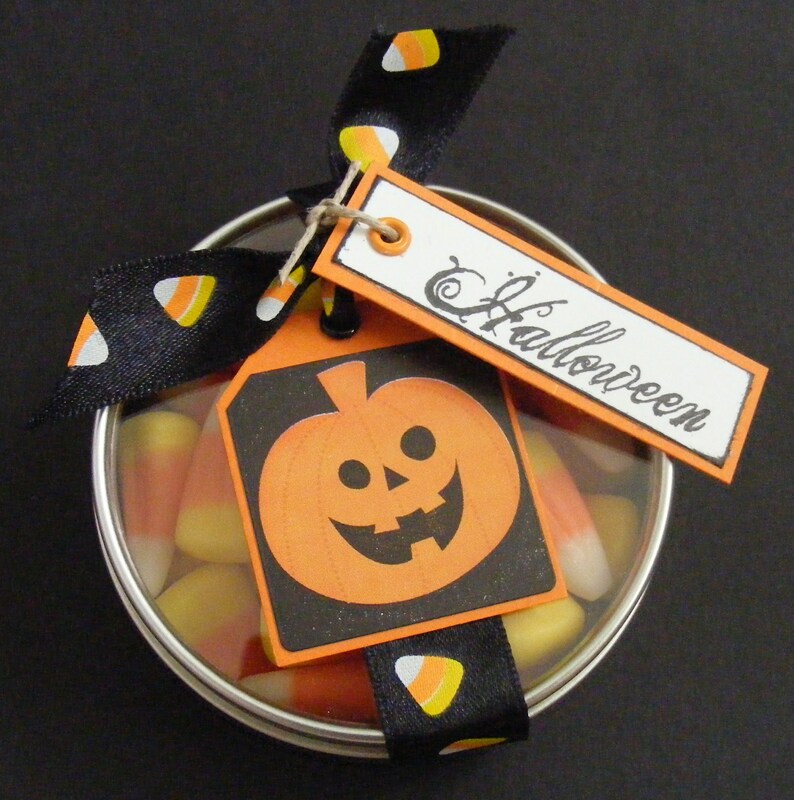 The tin is 2-1/2 x 1 inches and holds about 2 handfuls of candy. Perfect treat for your little trick-o-treater… or big trick-o-treater. They come in a pack of 4 for $5.95… very reasonable. Click on my TAC website (www.kandy.ismyangel.net) and pick up a few. They would also be great to use for little Christmas gifts for teachers, class parties, co-workers… the list is endless. Until next time, Keep Stamping! This entry was posted in Rubber Stamped Items, Treat Bags and Boxes and tagged gift, Halloween, jack o'lantern, pumpkin, Treat Bag, trick or treat bag. Bookmark the permalink. Great idea! Especially for school parties and trick or treaters.